In my herbal studies, I am learning to combine the ancient teachings of three schools of herb lore: Chinese, East Indian Ayurvedic and Western (United States) into a massive body of knowledge that will inform a material medica for me to choose from when assessing, diagnosing and prescribing remedies for individuals to maintain health and counteract illness and disease. This large, new culmination becomes a planetary medicine cabinet. I have started to apply this same principle to healing, fortifying medicinal foods as well. Although people who read this blog may think of me as a pork, egg and cream whoring foodie, the bottom line to my diet is that I take care during the week to fill myself up with valuable nutrients and life-affirming foods. The “unorthodox” part of my eating regimen is that I live by a pretty strict code of ingestion Monday through Friday so that I can spend a night or two every week enjoying sweets, fats and meats at leisure. This maintenance not only brings both pleasure and balance to my palate; it creates moderation of the sinful stuff and an overabundance of the vitamin stuff in ways that all equal out to a healthy body, sound mind and strong heart. Whether I am in the “good” parts of the week, or the “bad’ parts of the week, I try to stay true (and for the most part do) to my personal rule that I will not eat anything from a box, a bag, or a jar that contains preservatives and chemicals or is already pre-cooked. There is no microwave in my home. So when searching for breakfast and lunch dishes, I love to put on my herbalist’s hat and create combinations of foods that come from a planetary perspective of all the best nutritive ingredients in whatever is fresh at the moment. Recently, I perfected a cole slaw that brings in the coconut creaminess of Thailand, the cilantro brightness of Mexico, the breath of fresh coriander air that is India alongside the crunchy, cabbage goodness that birthed this traditional American dish. It turned out sweet, silky and highly addictive with every bite delivering an earthy undertone from a decidedly Chinese choice in sesame oil and the addition of toasted pecans to the sauce. In a blender, blend the oil, pecans, coconut milk, honey and lemon juice to make the dressing. 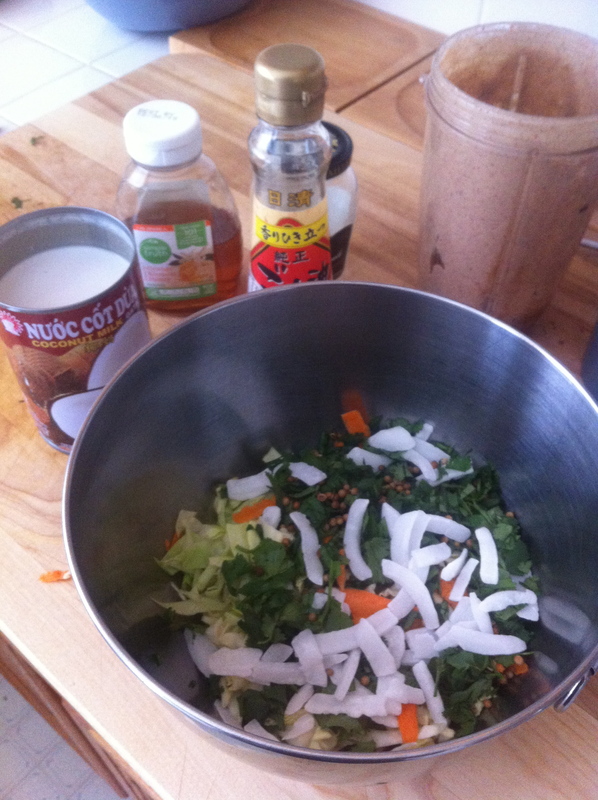 Combine the rest of the ingredients in a bowl and then toss with the blended dressing. Serve immediately. Makes 2-4 servings. This entry was posted in Art of Cooking and tagged art of cooking, ayurvedic recipes, cole slaw recipes, food as medicine, Kimberly Nichols, planetary food, planetary medicinal food, Unorthodox Foodie by unorthodoxfoodie. Bookmark the permalink.